Masterpiece Movie Series Megatron MPM-8! Authentic, ultra-premium action figure of the merciless Decepticon leader! Inspired by the 2007 Transformers live-action movie. 12-inches tall, Megatron comes with a Fusion Cannon, a Chain Whip, and an Allspark Cube. Features 43 points of articulation, including the hands and mouth! 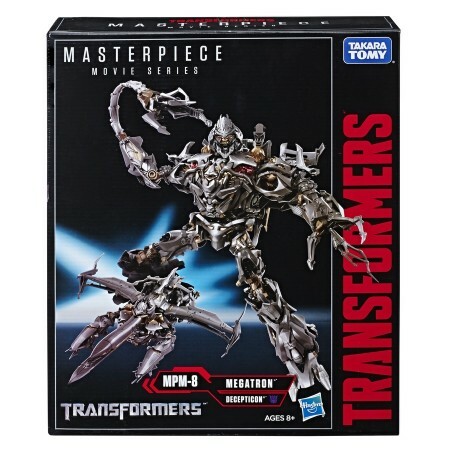 With features inspired by the explosive 2007 Transformers live-action movie, Masterpiece Movie Series Megatron MPM-8 measures about 12-inches tall and is a perfectly authentic figure for fans and collectors alike. It showcases the merciless Decepticon leader with impressive attention to detail and includes articulated hands and mouth (some of that die-cast metal detailing), plus Fusion Cannon, Chain Whip, and Allspark Cube accessories. Megatron converts from robot to Cybertronian jet mode in 50 steps and features 43 points of articulation. This ultra-premium Transformers Masterpiece Movie Series Megatron MPM-8 – Exclusive is a must for any Transformers collection! Transformers Masterpiece figures showcase the greatest Transformers characters in the highest level of detail (each figure sold separately). The Masterpiece Movie Series lineup includes iconic characters from the live-action Transformers movies, with movie-inspired details and accessories.